1 For the lobster, peel the vegetables and coarsely chop. 2 Bring 1.5 liters (approximately 1.5 quarts) of water and 100 ml (approximately 1/2 cup) of white wine to a boil, add the vegetables, parsley, thyme and bay. Season with salt and pepper, and simmer for about 15 minutes. 3 Add the lobster to the broth, headfirst and boil about 8-10 minutes depending on the size, until done. Remove and rinse with cold water. Cut in half lengthwise down the center with a large, sharp knife. Remove the tail meat and claw meat. Cut the tail in half. 4 For the salad, steam the beets approximately 30 minutes. Peel, let cool and cut into small cubes. Mix with 1 tablespoon oil and 1 tablespoon lemon juice. 5 Peel avocado, cut in half, remove the pit and cut into wedges. 6 Peel grapefruit with a sharp knife, remove the white pith and remove the fruit from the membranes into sections. 7 Rinse, trim and cut the lettuces into bite-sized pieces. Season with salt. 8 Arrange the avocado and grapefruit alternately in a flower shape on two plates. Place the mixed lettuce in the centers and surround the dges with the beet cubes. 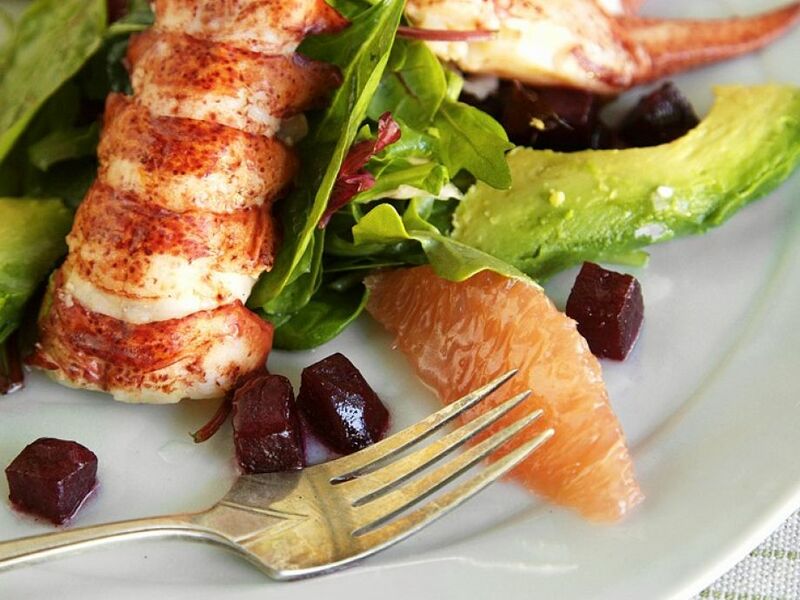 Place a pair of claws and a tail half on each salad. Mix together the remaining lemon juice and oil, drizzle over the salads and serve sprinkled with sea salt. 9 Cook Time: 55 min. 10 Preparation time: 15 min.